With Mother’s Day coming up this Sunday, you may be trying to think of something special to do for your own mother, grandmother, mother of your children, sister, aunt or anybody who is a mother-figure! To avoid the wait at busy restaurants, we suggest cooking a lovely Mother’s Day breakfast-in-bed (or breakfast at the table … this may be messy!) 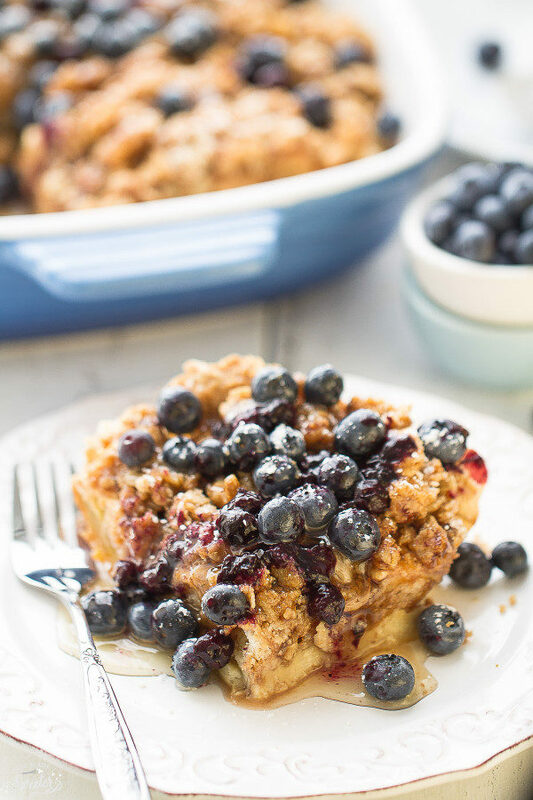 We found this yummy recipe on Pinterest from a blog called ‘Life Made Sweeter.’ Along with this scrumptious ‘Overnight Blueberry Cream Cheese French Toast Bake,’ (oh my!) top it off with coffee or freshly squeezed orange juice, pretty flowers from your local H-E-B Blooms, and a homemade card! Enjoy this recipe with the whole family … it is perfect for the kids to pitch in. Happy Mother’s Day! Lightly grease a 9x13 pan. Arrange half of the bread cubes in the bottom of the pan. Layer cream cheese cubes and 1 cup of blueberries evenly over the bread cubes. In a large bowl or measuring cup, whisk together the eggs, milk, maple syrup and vanilla. To make the streusel topping: In a medium bowl, combine the brown sugar, flour, and cinnamon together. Cut in the cubed butter with a pastry blender or two forks. Sprinkle evenly over the soaked bread. Top with remaining 1/2 cup blueberries. Cover pan with foil. Let chill in refrigerator overnight. In the morning, remove french toast from fridge. Preheat oven to 350 degrees. Bake covered with foil for 30 minutes. Remove the foil and bake for another 22-30 minutes or until golden. Meanwhile, make the blueberry syrup. In a medium saucepan over medium heat, cook water, sugar, and cornstarch until thickened. Stir in blueberries and simmer for 10 minutes. Add butter and stir until melted. Pour over baked french toast and top with additional toppings if desired. Best if served warm. To make this dish extra special, add powdered sugar and whipped cream. Yum!